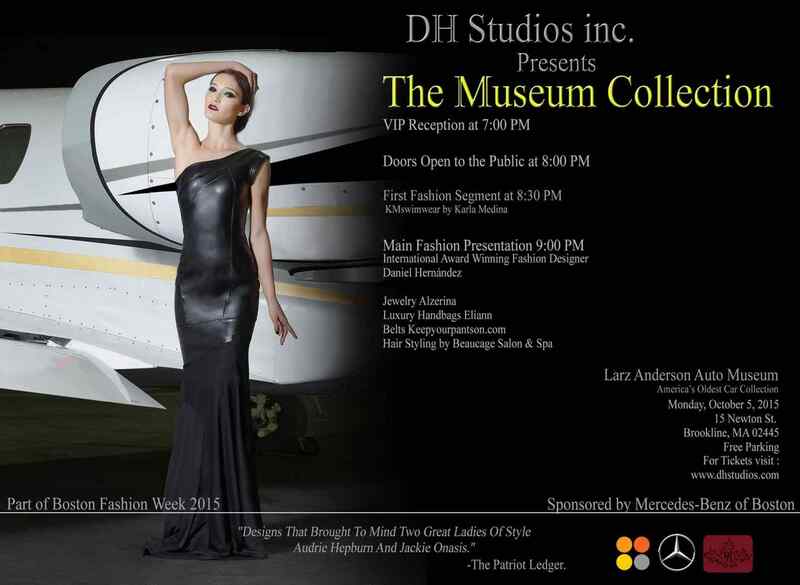 Daniel Hernandez and the Larz Anderson Auto Museum to host exclusive fashion presentation October 5, 2015. BOSTON - Sept. 25, 2015 - PRLog -- September ##, 2015 ­ Close to 200 industry experts turn out annually for the DH Studios Inc. fall fashion showcase during Boston Fashion Week. This year, the event will be held just outside the city at the historic Larz Anderson Auto Museum in Brookline, Massachusetts. Sponsored by Mercedes­Benz of Boston, International Award Winning Fashion Designer Daniel Hernández confirmed plans to debut "The Museum Collection," a luxury clothing line completely inspired by the venue and Mercedes­Benz's belief: "Fashion can be faddish or fashion can be forever. When fashion is forever, it's known by sophisticated construction, elegant execution, and a forward­thinking timelessness." Doors will open to the public on Monday, October 5th at 8PM. The 2015 showcase will commence with an exclusive presentation by Karla Medina and KMswimwear. DH Studios Inc. will take the runway at 9PM for the main event featuring an all­star accessories lineup including jewelry by Alzerina Gomez, handbags from Eliann Couture, and belts from KeepYourPantsOn.com. Guests of the event will enjoy an evening of creativity and couture, with a side of classic cars. Limited tickets remain available to the public.